Gloria fondly remembers the day she and Daniel married, making a Jell-o salad enjoyed on that special day. Today is one of those special days that makes me want to hang around Daniel as much as possible. It’s our wedding anniversary. Nine years ago we were both just bursting with joy, the vows of loving and caring for each other had been exchanged. Next came the long-awaited moment, as Grandpa Mast joined our hands in the marriage union, a commitment that was deeply settled in our hearts, that could never be changed or reverted by anything. I was aglow. People told me and I knew, that life would not be a ‘happily ever after’ story, that realities would settle in one day. I believed it, but in my heart, I was convinced that it will all be okay — how could it be otherwise with this fine young man who claimed me as his own? You just wouldn’t believe it. As I was writing just now, the door opened, in walked my Prince Charming with a gorgeous bouquet of a dozen red roses! I caught my breath, I didn’t know what to say. The timing was perfect, I had just finished tucking all the children in bed, and was enjoying some quiet moments (besides Rayni, who kept chattering in bed, convinced that it isn’t her nap time just yet). My eyes bulged. Could it be true? The vehicle I had heard driving into the driveway must have been the florist. In his hands was a giant vase holding a dozen red roses. It’s the first time in my life to have had a dozen red roses to my name. I don’t know exactly why, or where the significance of 12 of these beauties even originates. At any rate, I am profoundly grateful and humbled by this act of kindness from my husband on our special day. Daniel and I relished a few undisturbed moments together before it was time for him to go back to work again. Lets just put it this way, my heart feels full and running over. Now back to our wedding day. Even though we married in March, we had the most perfect weather, as the temperatures climbed into the mid-70s, and the sun shone warmly. The grass had just turned green, and the first flowers had begun to bloom. Even though it really was the best day of our lives, I wouldn’t want to go back permanently. I love our children, and not only that, the storms of life have had a way of drawing us together in ways I hadn’t imagined possible. Like I was reading in Luke 7:47, the lady that had much forgiven, also loved much; in the same token, our relationship has grown tighter, even by the times we have failed each other. As we choose to forgive completely, we get our focus off ourselves and make a choice to serve the other, no matter the cost. Daniel has been a powerful example in this area for me. As we celebrate nine years, I have the urge to make a dish we had at our wedding. 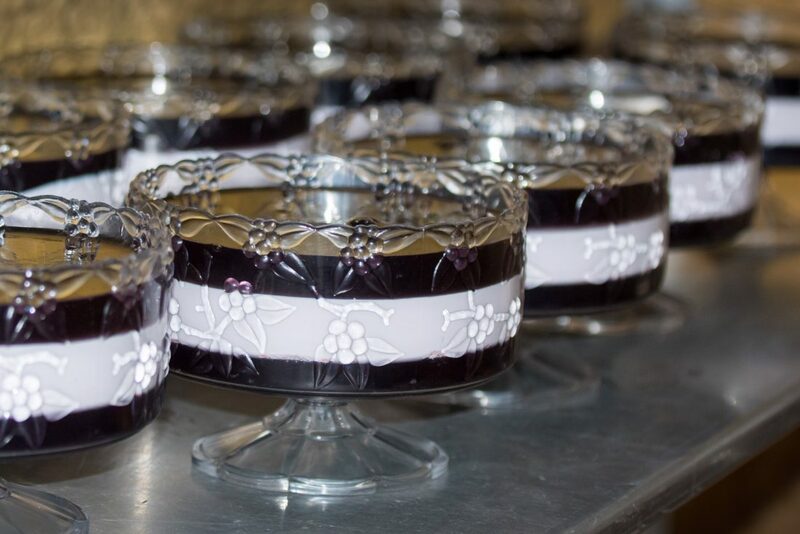 How about trying our grape Jell-o salad? Mix boiling water with Jell-o, mix until dissolved, add ice water. Pour into a 5 cup serving bowl. (I like using a clear glass bowl that shows the three layers.) Chill. Dissolve Jell-o in hot water, add cold water, chill until it has a syrupy consistency. Beat cream cheese and powdered sugar, add whipped topping (already whipped), only a little at a time, to keep it from getting lumpy. When blended, add Jell-o mixture and pour on first layer that has chilled until set. Chill again until set then repeat first layer, and pour on top of second mixture.